We woke well rested and refreshed this morning and were keen to set out for our day’s explorations into the mountains of the Longsheng region, about 100km north of Guilin. It was a long drive up narrow winding roads to reach this area, but the views along the way and in the village we visited were worth it. 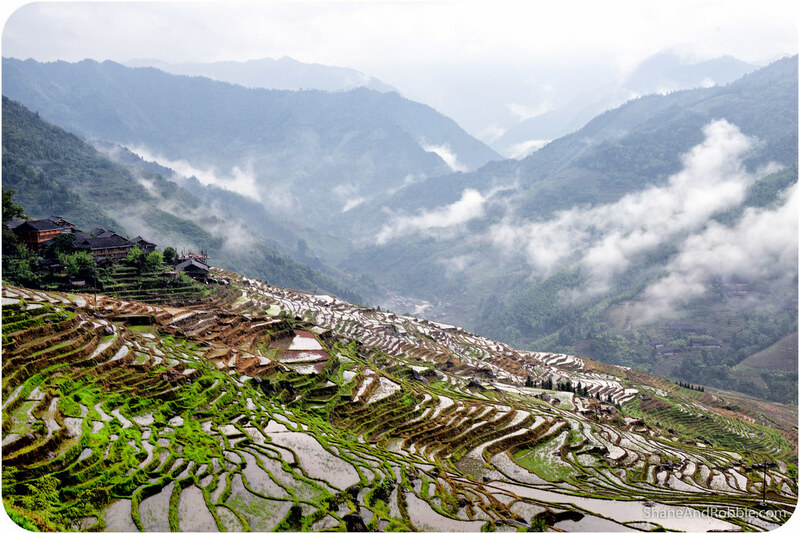 Longsheng county is home to the Longji Rice Terraces, one of this area’s most beautiful sights. 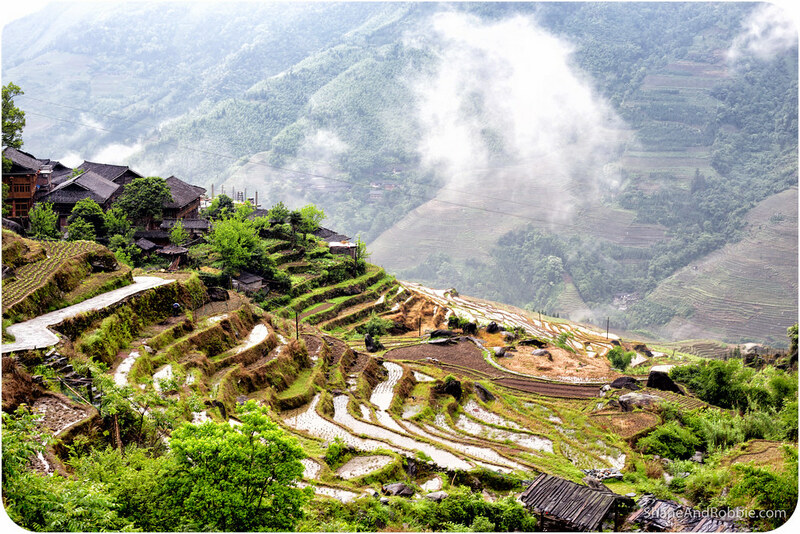 Carved out of the mountains over 700 years, the terraces of Longji represent generations worth of toil and effort by the Zhuang people that live in the area. 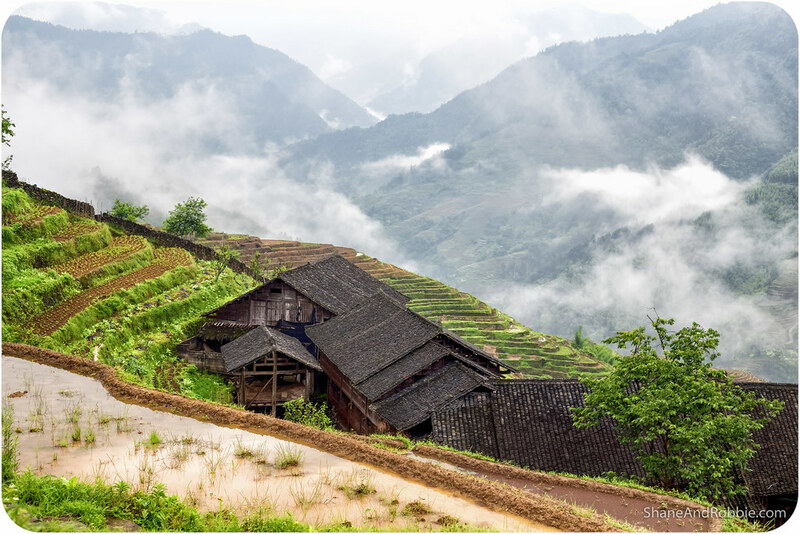 Longji means “Dragon-backed Mountain” or “Dragon’s Backbone”; a name that refers to the shape of the mountains in the area – all jagged and spiny like a dragon’s spine*. 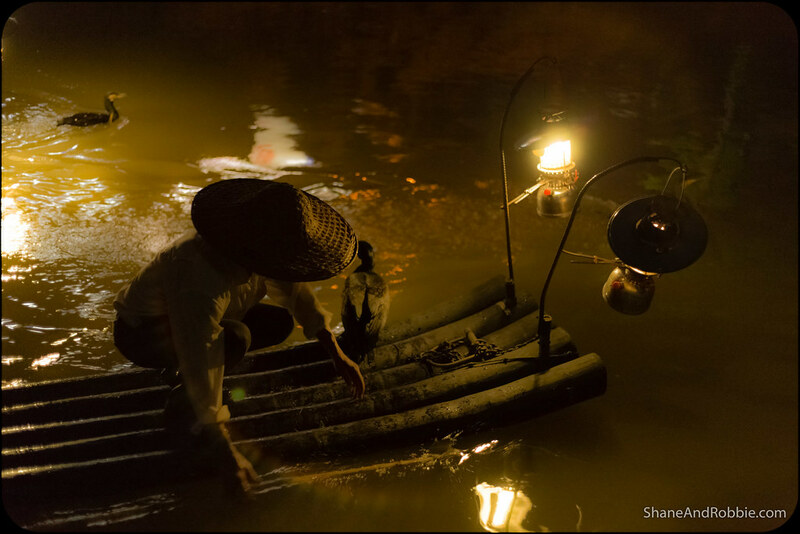 It is also said that when the rice paddies are full of water they resemble the shining scales on the back of a dragon. *The Chinese have some very evocative and poetic ways of describing the world around them. It sure makes things entertaining sometimes! 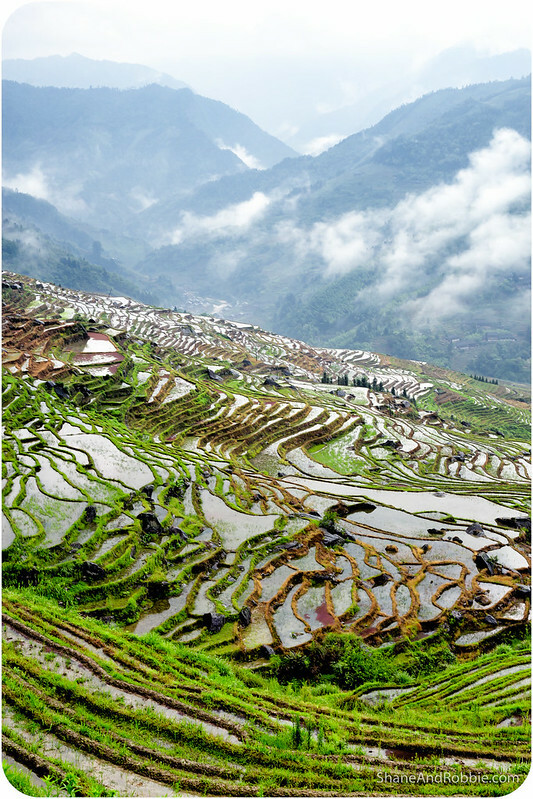 The terraced fields are built all along the slopes of the mountains, up to 1,100m*. They were carved out gradually, over a period of 700 years, by the Zhuang people. 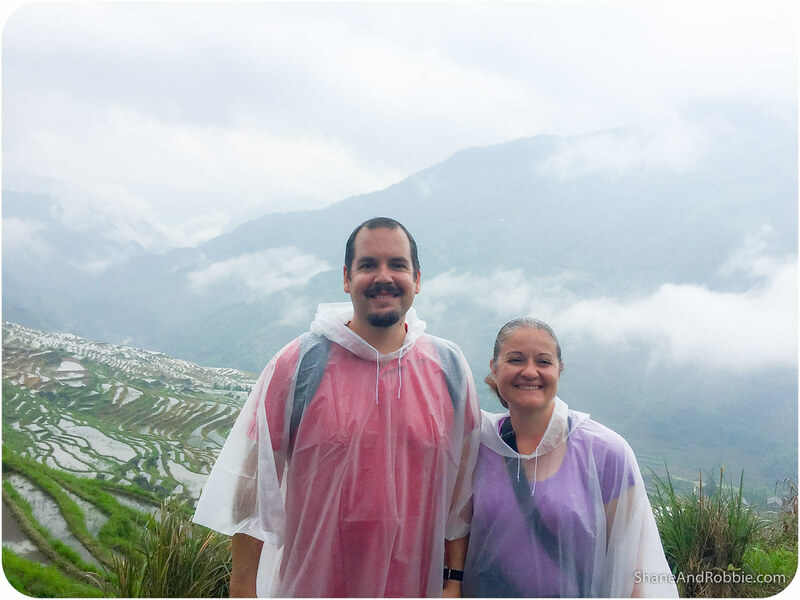 *We learnt today that, despite the sub-tropical climate of this region, the rice terraces of Longji are so high up that they get snow up there occasionally. 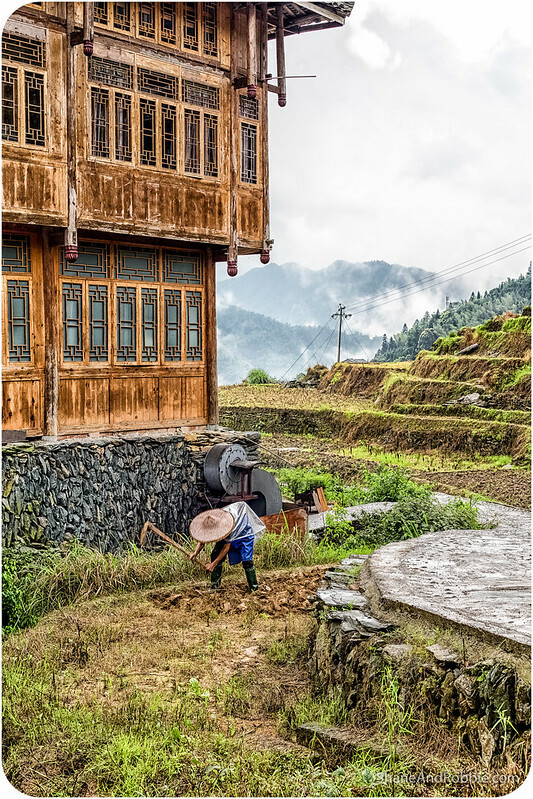 Originally the Zhuang people who moved to this area fled into the highlands in the 13th century to escape the restrictions placed on them by the Mongolian rulers of the time. 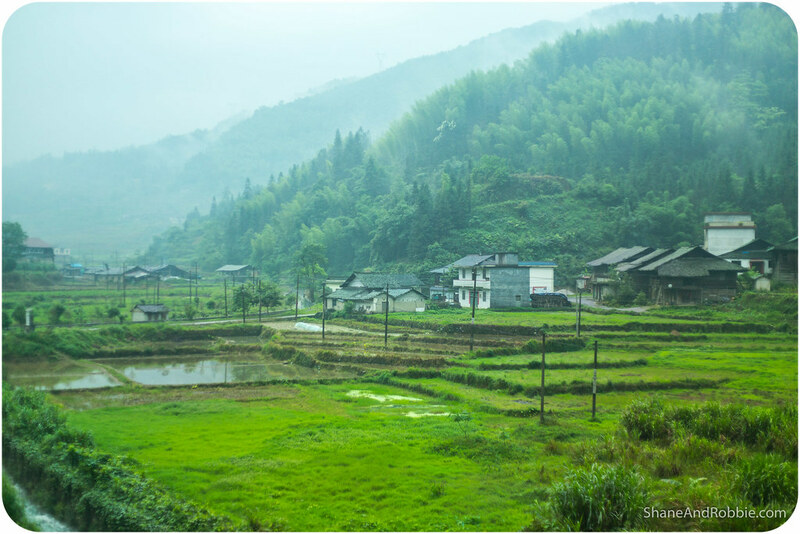 There are 8 villages in the mountains of Longshen, all of them populated by descendants of those original Zhuang refugees. The Zhuang are the indigenous peoples of Guangxi; they are one of the 56 ethnic groups officially recognised by the People’s Republic of China. 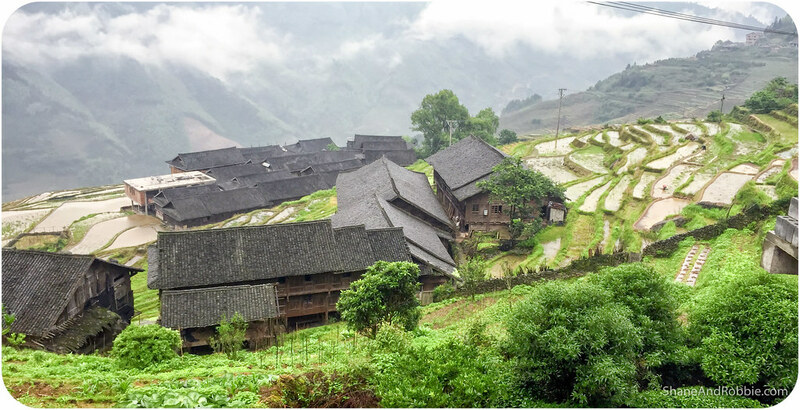 They live throughout Guangxi, but the villages high in the mountains of Longshen are unique in that they represent one of the best preserved examples of traditional Zhuang culture. 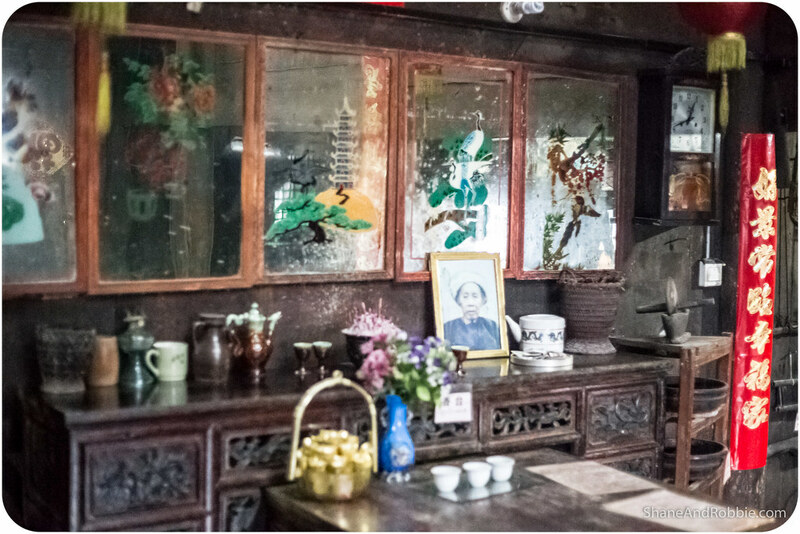 Ping’an, the village we visited, has a small museum that houses a few exhibits explaining how the Zhuang people used to live and how they used the basic tools available to them to alter the terrain around them and ensure their survival. We also visited one of the (still inhabited) traditional houses of the Zhuang; built from timber using no nails (just lots of clever carpentry), the house was 3 stories high and housed the family’s animals (ground floor), as well as the extended family themselves (middle floor). The top floor was used primarily for storage of food. Most Zhuang follow a traditional animist faith known as Moism, which include elements of ancestor worship. We saw the alter set up for this in the traditional house we visited. We had lunch at an eatery run by a local family in the village. 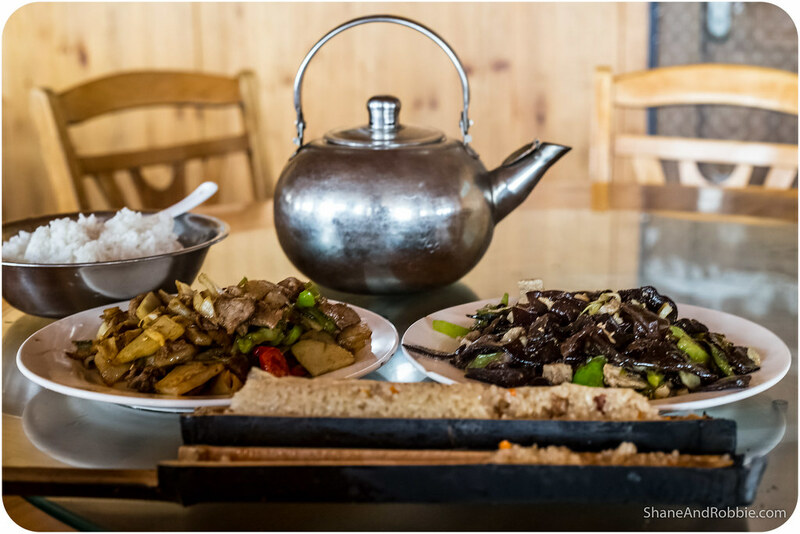 We were served a delicious meal of stir fried mountain funghi, stir fried chicken heavily laced with garlic and chilli, and some of the locally grown rice cooked in a bamboo tube (as is traditional for the Zhuang). The rice was especially delicious – it’s made with rice stuffed inside the hollow core of a bamboo section with some meat, vegetables and spices, then placed on the fire to cook. The flavour was great! After lunch we went walking through the village and around the rice terraces a bit more, but then the clouds that had been hanging around all morning decided it was time to dump their load of rain on us and it began to pour down. We took this as a signal that the day’s outing was at and end and followed Peter, our guide, back to the car for the long journey home. After a short respite back at the hotel we headed out for dinner. Being a touristy town, many of the restaurants around here have pictures of their food on the menu, which makes choosing your food much easier when you can’t read any Chinese! What caught our attention was the picture of an animal on the menu we couldn’t recognise – it looked somewhat like an ant-eater or armadillo but we couldn’t be sure. We took a photo of it and later asked Peter, our guide, what it was. He explained that this was a pangolin* – a rare delicacy eaten in this area. This had us in stitches because years ago we watched an Anthony Bourdain “No Reservations” travel show where he went to northern Vietnam and was offered “squeezle” for lunch; he ate it having no idea what squeezle was and only later found out it was armadillo. The reference stuck with us and we couldn’t believe we found actual squeezle meat on the menu here in China! *One Wikipedia search later we now know that the pangolin is a scaly anteater found in tropical regions throughout Africa and Asia. 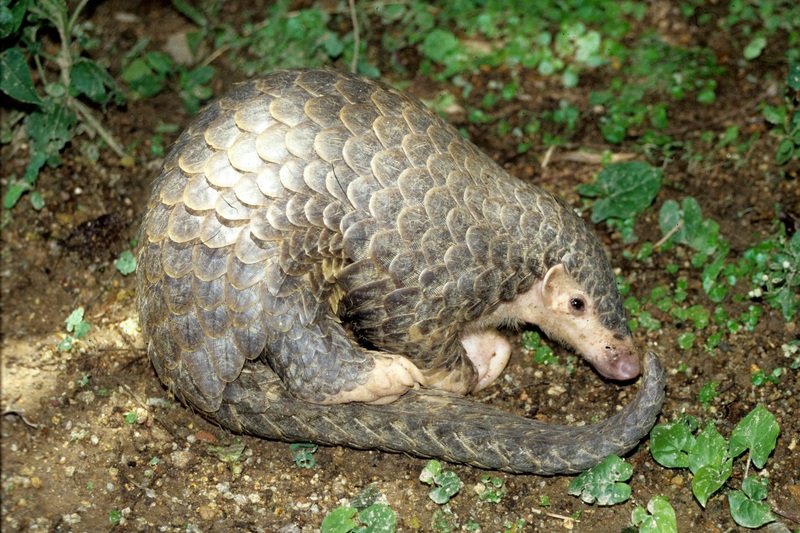 Pangolins are hunted and eaten in many parts of Africa and are also in great demand in China and Vietnam because their meat is considered a delicacy and some believe pangolin scales have medicinal qualities. This, coupled with deforestation, has led to a large decrease in the numbers of pangolins and it is now classified as a threatened species. Poor pangolins! For our evening’s entertainment we got to see a demonstration of cormorant fishing; this ancient technique was used by the Zhuang people for centuries as a means of benefiting from the bounty of the Li River. These days fish farms and modern fishing techniques have replaced this and cormorant fishing is only done for tourists. 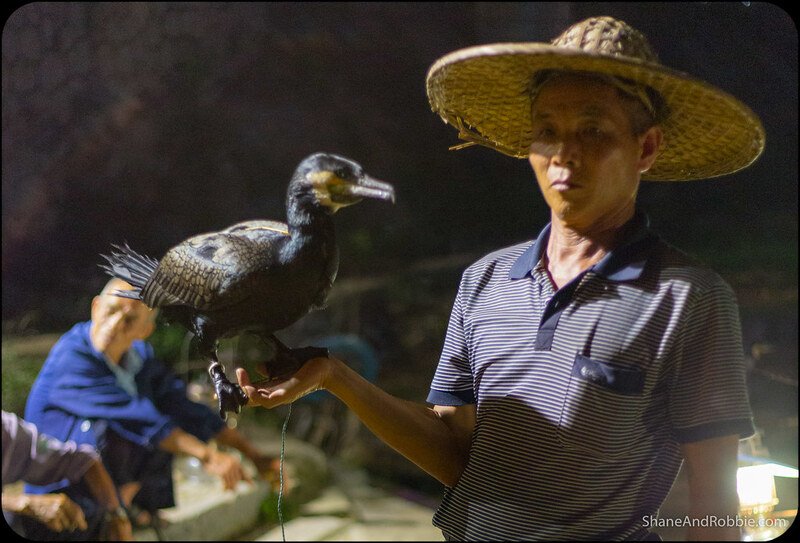 Even so, we thought it would be interesting to see how the fishermen use their trained cormorants to catch fish. 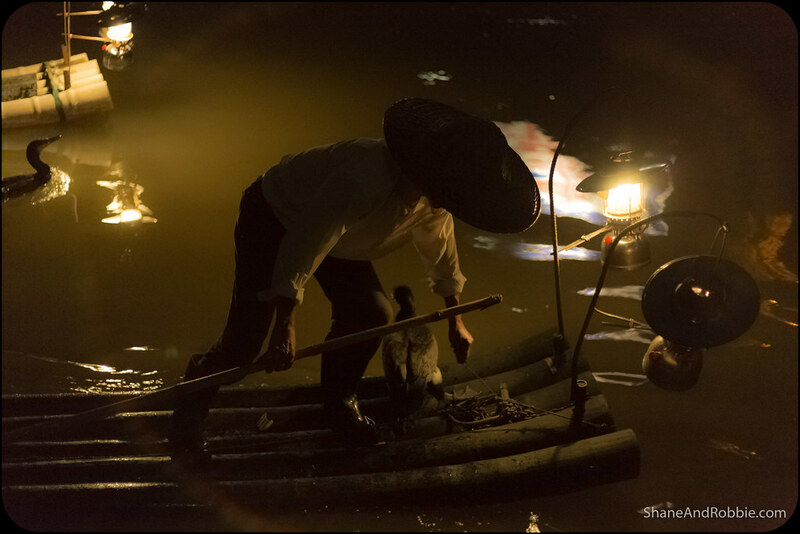 We watched from a boat as the fishermen and their cormorants poled their way down the river on traditional bamboo rafts. We got to watch as the birds dove under the water repeatedly and returned with fish for their keepers. The cormorants were prevented from swallowing any fish they caught by a ring around their necks, and the fishermen had to physically stick their hands down the birds’ throats to retrieve the fish. The whole process wasn’t nearly as romantic or beautiful as we thought it would be! All in all it was a very Zhuang-full day here in Guilin. 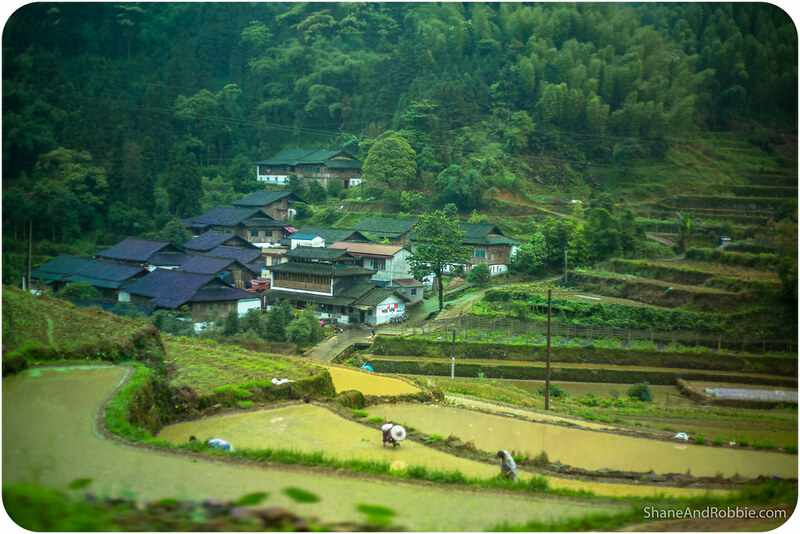 We LOVED the mountain villages of Longshen and the rice paddies of Longji and would love to come back with a bit more time up our sleeves one day to spend more time up there. For now though we have to pack our bags and prepare to head off again – tomorrow we’re off to Yangshuo to see a bit more of Guangxi’s beautiful landscapes.